I am trying to complete a war game on Hell Bound Hackers. I wish to use the nikto scanner to check some pages for vulnerabilities, however I first need to log into the Hell Bound Hackers war game, and then begin scanning Pen Test 1 challenge. The command I am trying to use is this, however the scanner keeps on getting redirected to the index page https://www.hellboundhackers.org which is frustrating as I wish to scan /challenge/pentest/pentest1/index.php. I believe this is because the authentication -id+ part is not working correctly? nikto -ssl -id username:password -h https://www.hellboundhackers.org/challenges/pentest/pentest1/index.php? EDIT: I believe I need to login with my web browser, and then somehow copy the cookie to nikto? Hence when scanning using nikto we will have to send across this cookie along with the requests. There are two ways that I know of to do this. Search for the text STATIC-COOKIE and add your cookie and its value like the image below. Now that we have added the cookie you might want to proxy it through burpsuite to verify the traffic that nikto generates. To do so set the proxy in the nikto.conf file as depicted in the image below. ERROR: Proxy error: opening stream: can't connect: proxy connect failed: proxy connect to 127.0.0.1:8080 failed: Invalid argument at /var/lib/nikto/plugins/LW2.pm line 5157. The above error could probably be caused by an SSL Error in Nikto itself. 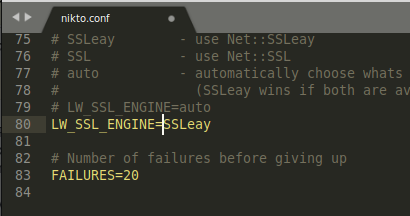 The temporary workaround would be to LW_SSL_ENGINE from auto to SSLeay as depicted in the image below. once again and observe the traffic in BurpSuite, Nikto should now ideally be scanning the Application with your added cookie. The second method is for you to try around. You could set the user-agent in nikto, proxy it through burp and replace the user-agent with the cookie value using the Match and Replace feature of burp. Do let me know if you find any issues while implementing the above fixes. Not the answer you're looking for? Browse other questions tagged web-application penetration-test vulnerability-scanners web-scanners or ask your own question.